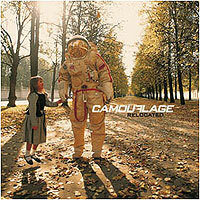 Putting a new Camouflage album in my hands is like giving candy to children. Music from my darlings has gradually replaced my initial cravings for sweets, snacks and chocolate. I am reaching my high through music, however pretentious that may sound. Camouflage's "Relocated" ends the three year drought since the masterfully crafted "Sensor" and, in the end, does so satisfactory. It is becoming more and more obvious how much Oliver Kreyssig means to Camouflage. He is a vibrant force to be reckoned with both vocally and in the song writing process and his presence has graced all their best releases, including "Voices & Images", "Methods of Silence" and "Sensor". "Relocated" is, as reported, slightly more pop tuned, but still holds all the Camouflage trademark elements. Personal vocal performances, gloom and pop all in one. The single "Motif Sky" is one of the tracks that have blossomed through repeated listening, as have "We Are Lovers" and my current favourite "Dreaming". Except for the exceptionally dreary "How Do You Feel? ", "Relocated" is a solid effort, maybe lacking somewhat in raw hit power. A few atmospheric instrumentals and moody ballads sung by Kreyssig heighten the hypnotic experience further. I, for one, hope that Camouflage continue to produce electronic pop in the future even though it took me quite a while to get into "Relocated". Not many bands with their life span (20 years plus) sound so vibrant these days.